The planning-budgeting conference-workshop participants in a photo opt with WMSU President Dr. Grace J. Rebollos (3rd from right). At least 47 officials of the Western Mindanao State University highed away to Tagaytay City on October 18 to 22 to engage in a strategic planning-budgeting conference-workshop. Strategic planning is resorted to in order to be more prepared and responsive to future organizational challenges; optimize performance; imbue top and middle level managers with a long-term paradigm; deal effectively with nagging management issues and concerns; and promote teamwork. The activity in Tagaytay afforded the various heads of offices, colleges, sections and units the chance to freely expound their current situation, assess their needs, set future directions and courses of action within a responsive decision-making framework to attain tangible goals, a documentation claimed. Likewise, the CY 2012 Budget, and the CY 2011 Annual Procurement Plan (APP) were deliberated upon, as well as other financial issues, in the presence of WMSU’s financial team. The goals of the different offices which were identified during the planning session will now become part of the University Development Plan. A copy of the same will be furnished the Regional Development Council (RDC) for inclusion in the Short and Medium Term Regional Development Plan (SMTRDP) under the social services development agenda. Being an academic community, the group’s discussions and outputs were geared towards threshing our academic concerns, fiscal management, general administration, and research and extension. Heads of offices present examined their respective performances, identified ways to improve the same, and/or considered other options to achieve optimum performance. 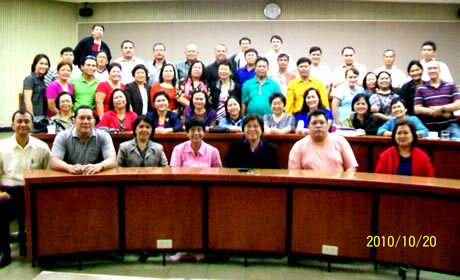 Moreover, the participants got a well-deserved break from the rigors of managing a huge institution. They were also afforded the chance to strengthen personal and professional bonds among themselves which will hopefully translate into enhanced working relationships and improved services for the university’s internal and external clientele. WMSU President Dr. Grace J. Rebollos presented the Senate version of the CY 2011 budget of the university which she herself presented before Honorable Edgardo Angara, Chair, Senate Committee on Education last October 11 at the Senate in Manila with all the other heads of State Universities and Colleges (SUCs) present. Dr. Loyda A. Bangahan, Vice-President for Planning, Administration and Finance presented during the conference-workshop excerpts of the Audit Report for CY 2009 of the Audit Team Leader, Commission on Audit, Region IX which contains the audit observations since 2008. She likewise discussed the implications of said observations on the future financial obligations of the university. The other resource persons and the topics presented were: Engr. Oscar Sicat, Planning Officer III – Strategic Planning Overview; Mr. Bernard Suriaga, Special Assistant to the VPPAF – Strategic Planning Forms; Engr. Armando A. Arquiza, University and Board Secretary – Review of the University’s Organizational Chart; Ms. Ma. Lourdes Alba, Finance Director and Ms. Rosalie G. Tan, Accountant III – Guidelines on the Preparation of CY 2011 Operating Budgets; Mr. Eric Alfaro, Supply Officer II – Guidelines on Property Accountability; Mr. Alfredo Montero, Supply Officer III – Overview of the Annual Procurement System and guidelines on the Preparation of the CY 2011 APP; and Mrs. Nida Cainglet, Budget Officer III – Guidelines on the Preparation of the CY 2012 Budget.